If you're a photographer and you say you're going to make your own albums, they better be awesome. And Chris and Alicia have definitely perfected this craft and made their handmade wedding albums awesome. 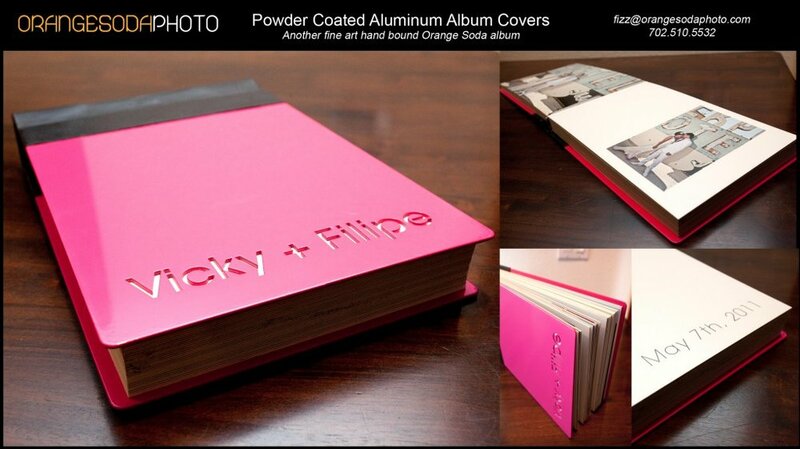 What they offer are powder coated aluminum albums. And since I have absolutely no clue what that means, I'm going to use their words to describe it and let their photos speak for themselves. The first time I saw one of the hot pink albums, I was green with envy that they weren't sitting on my own coffee table at home. "We start with a sheet of 2024T3 aircraft aluminum and laser cut the plate and design into the cover. With powder coating coming in a vast array of colors and being nearly 10 times stronger than traditional paint, it was the obvious choice. Finish it with a leather spine and you have an elegant, lightweight album that could easily withstand the zombie apocalypse in style. If James Bond wanted an album, this is what he’d have." Amazing right? Check out the close up photos below. Wedding Paper Divas Launches Treat.